Landscape masonry is an art. Odd Job Landscaping meticulously selects stone to ensure it complements the outdoor space perfectly. Oftentimes, masonry is installed to solve a specific problem, but that doesn’t mean it can’t be beautiful. 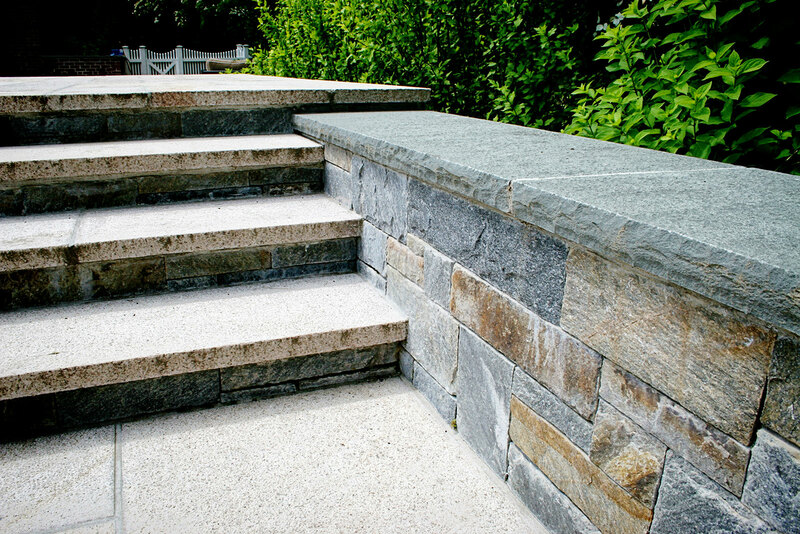 Take these square step stones with grass joints from a home in Darien, Connecticut, as an example. They are completely on-trend and offer a modern way to improve the aesthetics of the lawn. This minimalistic design adds an artistic flair while still serving its purpose of swaying people to walk on the stones instead of the sod. One glance at this photograph and it’s clear that our masonry services transformed the backyard of this New Canaan, Connecticut, home. We built everything from the fire pit to the outdoor grilling station to the pergola and spa at this home (not all are pictured), but the feature we want to focus on is the two four-foot retaining walls. While the double retaining walls are incredible to look at, they also serve as a barrier against flooding. Before our masonry design, this client had a serious drainage problem that caused the entire patio to become inundated with water when it rained. So we got to work building the two retaining walls with only our hands and a few small machines (large equipment wouldn’t fit). After removing 2,000 yards of dirt, installing drainage pipes, and then completing our masonry work on the walls that serve as a dam, the client can now rest easy when it rains. Lastly, the precision of our masonry skills provides a crisp distinction between spaces. Take this stone wall and decking as an example. Instead of the shrubbery overlapping the pathway, this rectangular veneer stone wall keeps the space clear while adding some amazing aesthetics to the area. Add in the stunning Chinese granite stairs and bluestone cap on the wall and this Greenwich, Connecticut, home looks like it came out of a magazine. Another example of the separation our masonry can provide is shown with this driveway in Darien, Connecticut. The oil and stone gravel is encased by a sublime 3-stone banding and antique Belgium block curbing to make it clear where the hardscaping ends and the landscaping begins. 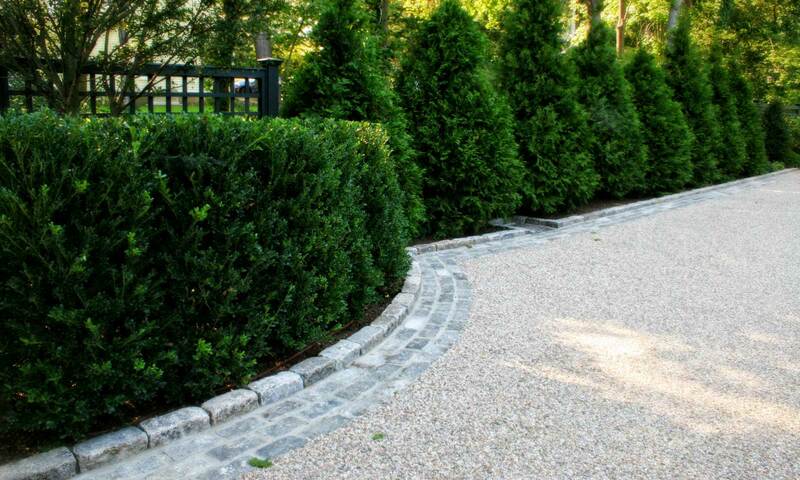 At Odd Job Landscaping, we have the precision and masonry experience necessary to improve the beauty and functionality of your Connecticut home’s outdoor landscape. Whether you are looking for a way to improve the aesthetics, eradicate flooding, or provide distinction, contact us today to find out how we can make it happen.